Roshen Alkazi (1923-2007) was a scholar and costumer designer. 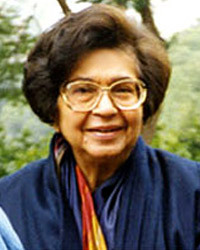 She and E. Alkazi were closely associated with the contemporary art movement in Bombay and Delhi since the 1940s. Since 1977, they presented over 350 exhibitions, ranging from distinguished artists including Somnath Hore, Tyeb Mehta, F.N. Souza, M.F. Husain, Akbar Padamsee, K.G. Subramanyan, among others. Roshen Alkazi was one of the few Indian costumiers for whom the art was a serious, passionate venture to recreate a particular period accurately on stage or screen. She studied costume at the Victoria and Albert Museum, London. She married E. Alkazi in 1945and was actively associated with his work in Bombay and New Delhi, designing costumes in more than 70 productions for Theatre Group and Theatre Unit in Bombay and then for the National School of Drama. Her range covered Shakespeare’s King Lear and Othello, Buechner’s Danton’s Death and Shanta Gandhi’s Jasma Odan. She taught the history of costume at the New Delhi Polytechnic for several years. An authority on jewellery, headgear, and hairstyles in ancient India, she published Ancient Indian Costume and Medieval Indian Costume, extensively illustrated and monumental volumes based on her study and practical knowledge of the subject. She has written books of poetry and was Director of Art Heritage for thirty years.